For formatting and cost reasons, the kindle version is black and white. For those of you who want the full-color PDF version, let me know and I can send it to you via email. Those of you who’d prefer a print version can purchase it at cost plus shipping (as soon as it is available). Again, just let me know and I’ll get it to you. When our daughter was young, Bible reading came easily. I simply added it to our nightly story time. Then the tween years hit, and suddenly it became a struggle. I wanted her to grab hold of her faith–to grow excited about the things of God, but she still seemed to need a great deal of prodding. I got worried. I knew she was saved, so why wasn’t she hungry for God’s Word? What could I do to help her grow excited about spiritual matters? I tried everything. Nagging, reminding … nagging. And more nagging. So I pulled back and increased my prayers, asking God to help me make spiritual matters more natural. I soon realized the best spiritual discussions flowed from our day–from what God was teaching me. 13 So if you faithfully obey the commands I am giving you today—to love the Lord your God and to serve him with all your heart and with all your soul— 14 then I will send rain on your land in its season, both autumn and spring rains, so that you may gather in your grain, new wine and olive oil. 15 I will provide grass in the fields for your cattle, and you will eat and be satisfied. 16 Be careful, or you will be enticed to turn away and worship other gods and bow down to them. 17 Then the Lord’s anger will burn against you, and he will shut up the heavens so that it will not rain and the ground will yield no produce, and you will soon perish from the good land the Lord is giving you. 18 Fix these words of mine in your hearts and minds; tie them as symbols on your hands and bind them on your foreheads. 19 Teach them to your children, talking about them when you sit at home and when you walk along the road, when you lie down and when you get up. 20 Write them on the doorframes of your houses and on your gates, 21 so that your days and the days of your children may be many in the land the Lord swore to give your ancestors, as many as the days that the heavens are above the earth. I imagine many of you are familiar with the latter part of this passage–the portion talking about training your children. But I began at verse 13 on purpose, because we can “teach” ourselves breathless, but if we’re not living our faith out, our words will be nothing more than noise, and annoying noise at that. But when our words are backed up by consistent action–wow, what a powerful example that sets. It’s really not hard, although at first it might feel awkward, but like anything, the more we do it, the easier it becomes. 1. I begin with prayer, asking God to help me stay alert to natural opportunities to share what God’s doing in my life. I’ve found openly talking about a personal area in need of growth really helps open our daughter up. Never be afraid to share spiritual struggles with your children–areas where you come up short and where God is working to grow you. This helps remove the “I am parent-you are child, so listen” atmosphere, creating one that is instead more relaxed and loving. 2. Pray out loud. Prayers flit through my brain often, but for some reason, they rarely left my lips. Then one day I realized how many teaching moments I was missing out on simply because I kept my prayers silent. What if I began saying them out loud so my daughter could hear them–not just those family prayers over mealtimes or before bed, but the quick shout-out, one sentence prayers? And what if I verbalized gratitude for things I encountered throughout the day? Would that make it more natural for our daughter to do the same? 3. I began to help my daughter connect the spiritual dots throughout her day–to stay alert to “God-happenings.” A funny thing happened–the more we expressed gratitude for things God had done, the more we saw His hand throughout the day. Let’s talk about this. What are some ways you live out God’s commands in Deuteronomy 11? Any special childhood memories you can share, perhaps of a dear grandmother who often told you Bible stories near a crackling fire? Or maybe of a special note with a Bible verse included your mother used to slip into your school lunch? 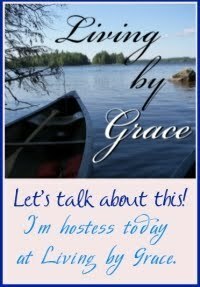 Share your thoughts and stories in the comments below or on Facebook at Living by Grace.